Porvair Sciences has introduced a new range of pierceable cap mats from sister company, JG Finneran Associates Inc. 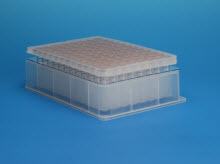 These new cap mats ensure the integrity of samples in Porvair 96-well Deep well microplate with glass inserts used in high throughput chromatography. Manufactured from chemically resistant PTFE with a silicone lining, the new JG Finneran pierceable cap mats come with a specially weakened area in a shape of a cross on each of the 96-well sections. For automated high throughput chromatography applications where piercing and re-sealing is required the new cap mats allow easy, reproducible access while maintaining a high integrity seal on individual plate wells. Manufactured under clean room conditions from pure high-grade polymers, the new cap mats contain no contaminants that may leach out and affect samples. Cap mats are available for Porvair Sciences complete range of round and square 96-well deep-well plates. All Porvair 96-well deep well plates are precisely made to ANSI/SLAS dimensions ensuring complete compatibility with almost all readers, washers and automated equipment.